M48 Combat Toothpick Knife With Shoulder Harness - AUS-8 Stainless Steel Blade, TPR Handle, Brass Lanyard Hole - Length 9 1/4" | BUDK.com - Knives & Swords At The Lowest Prices! 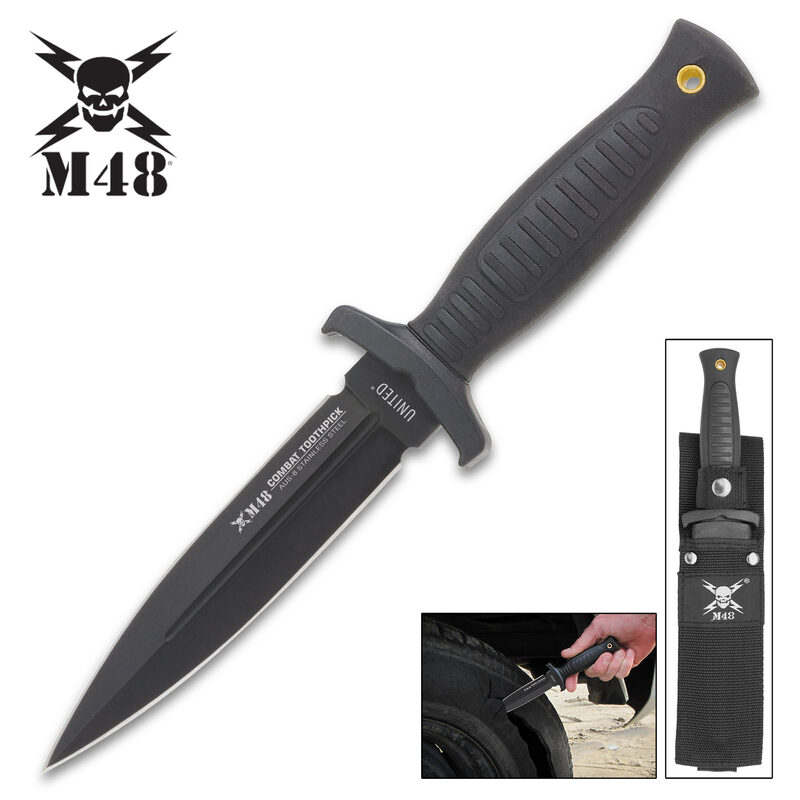 M48 Combat Toothpick Knife With Shoulder Harness - AUS-8 Stainless Steel Blade, TPR Handle, Brass Lanyard Hole - Length 9 1/4"
For fast, reliable protection whenever you need it, the M48 Combat Toothpick offers excellent concealment and strength in one small package. It has a keenly sharp, 5" steel blade with a black, non-reflective coating and a piercing point. The knife has an injection molded TPR handle, which is ridged for a secure, no-slip grip, and a brass lanyard hole. 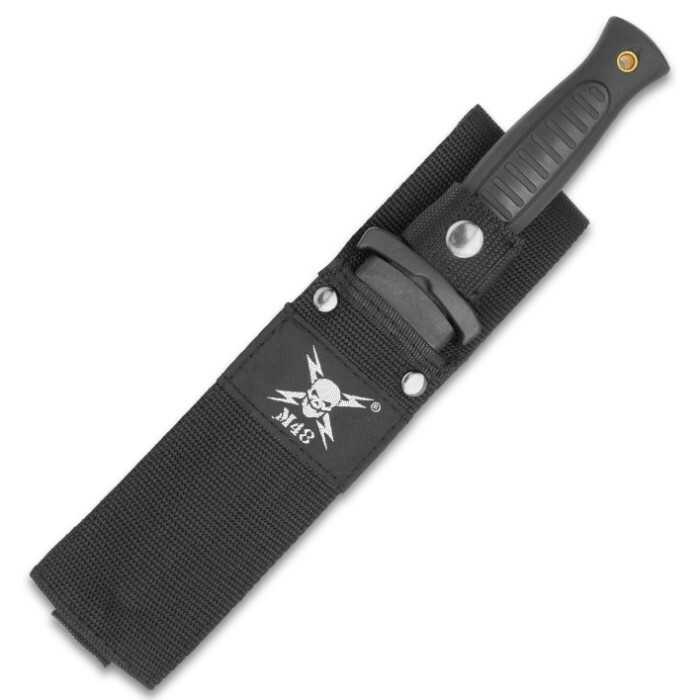 It is 9 1/4" in overall length and fits securely in a sturdy, nylon sheath with shoulder harness for easy, covert carry. You'll be prepared for almost anything with this menacing blade! This is a really great knife for it's price. The balance is very nice and well weighted for both combat and throwing if needed. I received this today in the mystery no box elite level and I immediately fell in love with it. I love dagger and boot knifes. The only drawback, I'm not a fan of the sheath. With no retention aside from the cheap snap, not what I would call a safe sheath. 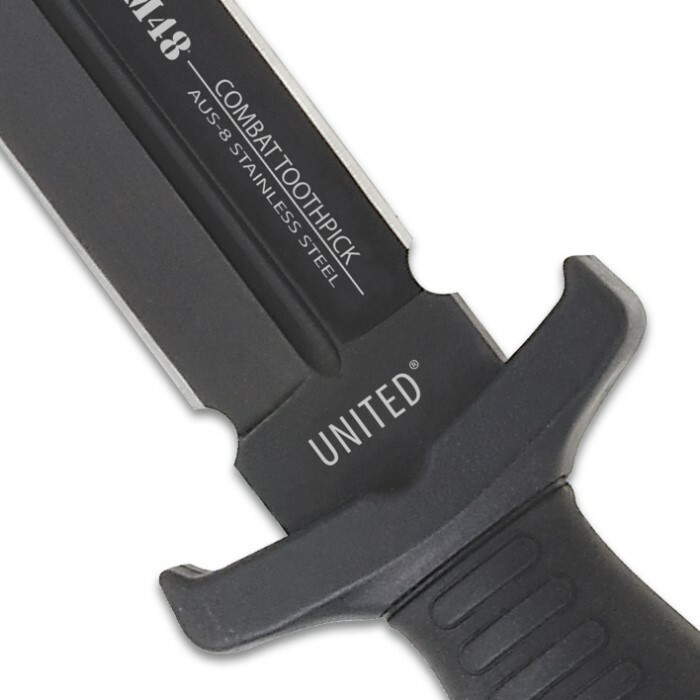 Kydex would have been a better option for this blade especially with it's tactical designs. Aside from the sheath, love this dagger and will definitely be buying another when I get the chance. I will give the knife 5 stars at the moment, I haven't had any issues with it, although I've only used it minimally. Now with that in mind, I would give the shoulder harness and sheath maybe 2 stars, as I am a huge guy the threading had started separating after an hour of wearing, maybe even when I was adjusting it to my shoulder width and height, and I would prefer better constructing in the sheath, the Velcro won't last long and may be a safety issue in future. As has been said in another comment, this is not a boot knife. This is truly a dagger, heavy construction, excellent weight, thick blade, sharp point. Personally I would sharpen this blade up a little bit, and I have no qualms about it holding an edge. The handle is awesome for folks with large hands, the injection mold fits the hand really well, will not slip around. This is the first time I have seen a hard sheath, set into nylon, awesome design. Only negatives about this knife, is the no lock sheath. When in the face down position (pummel down, tip up) it is extremely easy to have the knife fall out. Unless you take the time to use both hands to re-snap the blade into place, it will free fall, as there is absolutely nothing locking the blade into the sheath. A slight lock would be a nice addition, without interfering with a fast open.